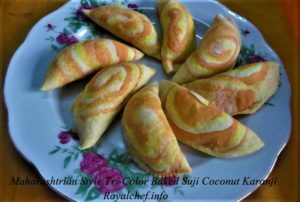 This is a Recipe for making at home sweet, tasty and delicious Maharashtrian Style Tri-Color Baked Suji Coconut Karanji. This Karanji can also be prepared for the Diwali Faral snacks. 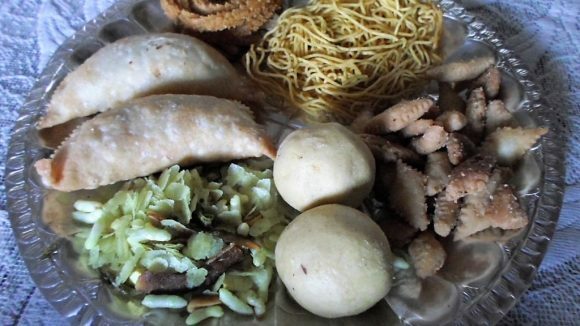 This Karanj, which is prepared using Coconut, Mik and Sugar and assorted dry-fruits and a Siji Covering is especially useful for those people who avoid deep-fried or oily sweets. You can easily prepare this Karanji at home by following the step-by-step method given below. For the Stuffing: In a Kadai mix the shredded Coconut, Sugar and Milk and keep it on a medium flame until the mixture become thick or a little dry, in between stir the mixture. Then keep it aside for cooling. After cooling grind it in a mixer and add the crushed Almonds, Cashew nuts, Cardamon Powder and Raisins. For the Spreading (Sata): In a stainless steel plate take the melted Ghee or Vanaspati Ghee and beat it with your finger, it should be fluffy then add the Cornflour and mix it well. For the Covering: Mix the Suji, Salt, Baking Powder and Ghee. Then add the Milk and some Water and prepare a Dough of medium consistency and keep it aside for 20-30 minutes. Then grind it slightly in the mixer. While preparing the Dough divide the mixture into 3 parts. Add Green color in the first part or portion and prepare the Dough. In the second portion add Orange or Yellow Color and prepare the Dough. Keep the Third portion as it is. Then divide the each portion of the Dough into two parts. Roll each portion of the Dough into Chapati size shapes. First take one Color Chapati and spread ¾ tablespoon of the Cornflour mixture over it evenly, then keep another Color Chapati and again spread the Cornflour mixture over the Chapati, then keep the third Chapati and again put the Cornflour mixture over it and fold all the 3 Chapatis into a tight roll and then cut the roll into 1” size pieces. Prepare remaining Chapati in a same procedure. For the Karanji: Before preparing take 2 Tablespoon of Water or Milk for sticking the Karanji, Karanji Cutter and wet cloth. Take one ball and keep the layered side on top and roll it gently into a medium size Puri and insert 1 or 1 ½ spoon of the stuffing mixture on it and apply few drops water or Milk on the edge of the Puri and then fold the Puri. Press from the sides and cut it with a Karanji Cutter, and then keep it over the wet cloth, prepare 8-10 Karanjis using the same procedure and keep them over the wet Cloth. Then arrange the 10 Karanjis on a baking dish. Preheat the Oven and then adjust it to 180 degrees temperature for 20-25 minutes, and keep the baking dish inside the Microwave. In between, open the Microwave and turn the Karanjis. After 20-25 minutes remove the Karanjis and keep them for cooling. Prepare all the Karanjis using the same procedure. When all Karanji cool, store them in an airtight container.